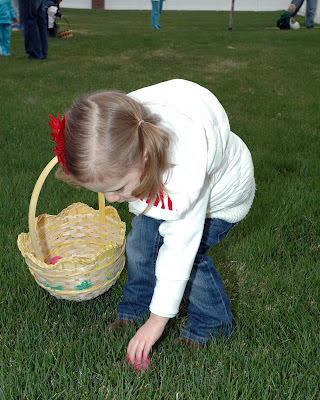 Our Easter festivities this year began Saturday afternoon with an Easter egg hunt hosted at our church. 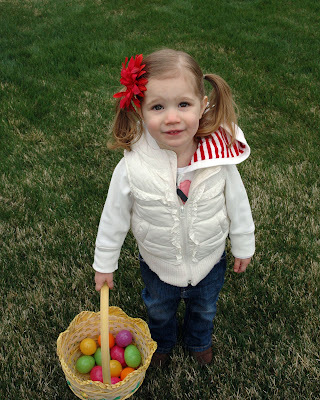 This was Ava's first Easter egg hunt and it took her a bit to figure things out. 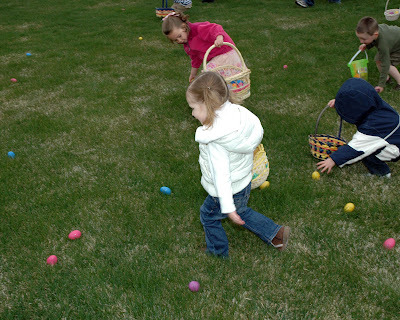 When the whistle blew, she began running past all the eggs while the other kids began filling their baskets. Eventually she figured out what she was supposed to do. Despite her slow start, she managed to at least cover the bottom of her basket. As far as she was concerned, she did great. Next we went over to Granny O's house for Easter egg painting. 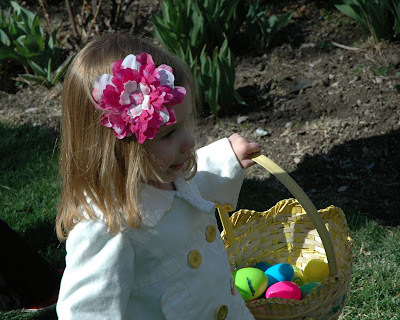 Despite having a large assortment of dyes, stickers, and other decorative adornments, Ava just wanted to dunk all of her eggs in the blue dye. 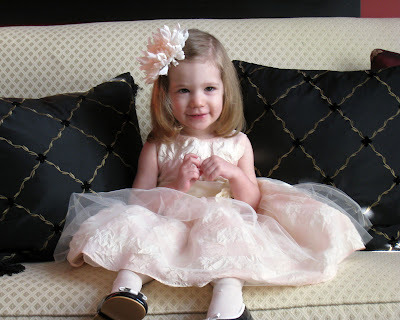 The next morning we went to church and Ava wore a lovely Easter dress from Granny O. 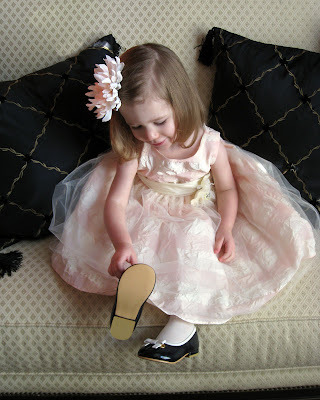 She also got to wear her new shoes, which she was quite fond of. In Ava's nursery class, they made paper cut-outs of the resurrected Jesus, the tomb, and the stone which was rolled away from in front of the tomb. Ava is still carrying it around and telling us about the resurrection story. That afternoon we went back to Granny O's house for another Easter egg hunt. 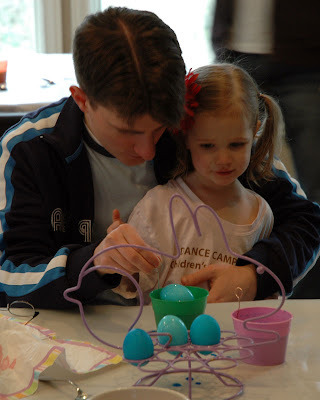 This time Ava knew exactly what to do, although she still seemed to end up with the least number of eggs. Apparently she just wasn't much of a match for newlyweds Betsy and Owen. 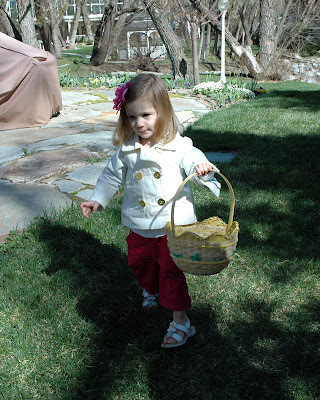 Ava was most excited when she spotted her Easter basket. 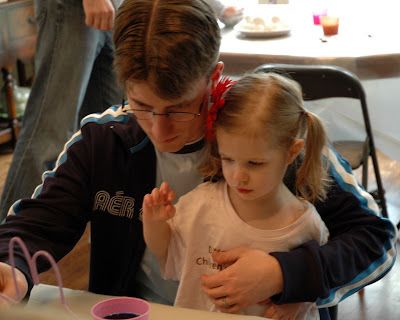 Easter 2009 was very fun and we look forward to celebrating next year with the addition of baby Jellybean. Wow Ava's hair is getting so long!